The Hunger Games… If you’ve never heard of it, then where on earth have you been hiding? The book was first published in 2008 but has only recently come to my attention, which probably has something to do with the recently released film – oh, and the fact that EVERYONE has been talking about nothing else for the last few months! In the end, I was finally persuaded to buy the first book in the trilogy when I saw it for a couple of pounds in my local charity shop. It was perfect timing, as I had just finished struggling through two particularly long and challenging books and was on the look out for an addictive, but quick and easy read. So, did it live up to all the hype? Well, yes and no. It’s true that, like everyone else, I rushed through the book, hardly stopping for food. However, by the end, I did not find myself desperate to read the next book in the trilogy. Set in a dark and not-too-distant future, North America as we know it has become Panem; a country divided into 12 districts and controlled by the powerful government in the rich city of the Capitol. In the Capitol, people don’t go hungry and only seem to care about what colour to dye their skin, which is very different from the poor and deprived districts, where starvation is a common cause of death. The Hunger Games, an annual televised show, was designed years earlier as a warning after an uprising. It keeps the districts in-line and reminds them of the power and total control of the government. One boy and one girl between the ages of 12 and 18 from each district are chosen at random to be ‘tributes’. These 24 tributes are taken to an arena where they will have to fight to the death. It certainly sounds a bit more exciting than watching a bunch of idiots getting drunk in the Big Brother house! 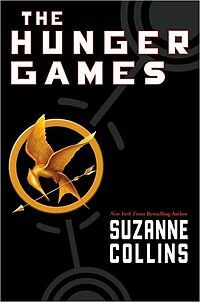 The book doesn’t hang about – it jumps right in to the difficult life of 16 year old Katniss Everdeen of District 12. With a dead father, fragile mother and 12 year old sister, Katniss has had to take on the responsibility of head of the family. When, beyond all odds, her sister’s name is called out for the 74th Hunger Games, Katniss does the only thing that she can and offers herself as tribute instead. There is a good balance of action and danger, mixed with flash-backs of Katniss’ life in District 12. The reader, like Katniss, is constantly kept on their toes, waiting for the announcement of another death. As you would guess, characters are killed off quite rapidly, but the book is not too gory or violent. For me, the most barbaric thing about The Hunger Games, is the way the people in the Captiol react to the games by placing bets on how each child will die. We’re becoming such a reality-TV obsessed society, that it really made me shudder at times. The thing that most put me off The Hunger Games was the ‘romance’ storyline that became prominent towards the end of the book. It was unrealistic and clumsily dealt with. Obviously, this story is aimed at a younger audience, but I think even my teenage self would have found it silly. Maybe the whole ‘romance’ thing is why I’m not looking forward to the next book. I liked the concept of the deadly Hunger Games, but now that’s over, I can’t see where the book will go. I’m hoping the plot isn’t based on an underground rebellion because I liked the way The Hunger Games didn’t dwell dramatically on overthrowing the system, but rather showed more subtle and realistic gestures of dissatisfaction. After reading the book, I’m excited to see the film. It will be interesting to see if the romance scenes makes more sense on screen and I’m curious to see how Katniss will come across. I think there are much better dystopian novels for young people out there, but it’s still definitely worth giving this one a go. Want to give it a try? Click the picture below to buy it! I’ll read the other books at some point. Who knows, maybe I’ll really like them! I also agree that the romance comes off as awkward and out of nowhere. The movie is good though. My problem however with both the novel and the film adaptation is that Collins goes to all this trouble to establish Katniss as a strong female hero– and then avoids putting her into any situation that forces her to make a hard decision. How interesting would it be if the one time she actually has to kill someone was in a life-or-death battle where the other person is just another kid trying to save his or her own life. Instead, Katniss only has to kill when it is clearly righteous to do so (namely, when Prue is killed). It’s like Collins doesn’t think her readers are smart enough to deal with anything less than a clear cut, black and white morality. I always enjoy your reviews and am going to try to comment more often in the future! Yes, I have been thinking the same and wondering whether Katniss might be put in a situation like that in the next book. She won’t always be able to have such an easy ending surely? I’m looking forward to the film – I’ve mostly only heard good things, especially from people that have already read the book. I also didn’t fall in love with the book. I’ve read the first, and I’m a quarter of the way through the second but the second feels like a struggle to me. I like the plot, but that is about all that fell into place for me. I didn’t particularly feel for the characters. Although, I would be interested to see the movie- I have a strange feeling it is one of those novels that actually works better onscreen! Yes, I was thinking that too. I’ve heard the film is really good and can imagine it beng better than the book! I like your interesting take on Hunger Games. I admit that I did not give much thought to the romance. I can see why it would appear clumsy and awkward though~ kinda like teenagers in a way. I’ll definitely read the next two – you’ve made me want to now anyway! I’m intrigued!